Congress leader Patil has refused to settle for anything but the Deputy Chief Minister's post and threatened of having the backing of 15-20 dissent MLAs who will decide further course of action. 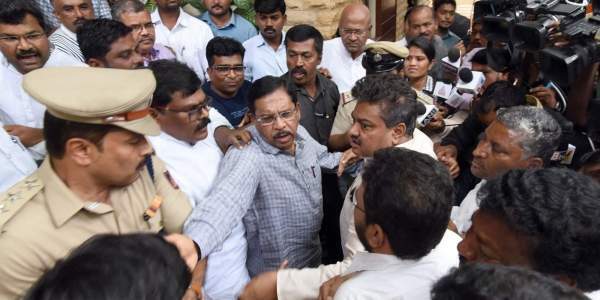 BENGALURU: Three days after the rebellion erupted within the Congress party in Karnataka over the expansion of the coalition ministry, the dissident leader M B Patil was summoned to Delhi, for placatory talks by the party high command to resolve the crisis. The move came after Chief Minister H D Kumaraswamy himself intervened and met the dissident Congress leaders. Patil, who has raised a banner of revolt, has upped the ante and is likely to demand the Deputy Chief Minister’s post, conveying the message that he will not settle for anything less. With the ranks of the dissidents seeing a steady rise and the former minister outrightly ignoring the efforts of state leaders, including KPCC president G Parameshwara and working president Dinesh Gundu Rao, ministers K J George, D K Shivakumar and R V Deshpande, towards a rapprochement, the party high command on Friday evening invited him to Delhi. Interestingly, the call came within hours after Kumaraswamy met Patil and assured to take up the issue with the Congress high command while expressing confidence of ending the standoff at the earliest. Kumaraswamy urged Patil not to take any hasty decision and sought his cooperation to provide a stable government. “M B Patil is hurt as he feels let down by his party leadership. Patil had worked hard and contributed much to the cause of the party. I will take up the issue with the top Congress leadership to resolve the issue at the earliest as it is necessary for me to provide a stable government in the state,” Kumaraswamy said. Patil, however, ruled out the possibility of quitting the party. “Congress party has dumped me. But I cannot dump Congress. I cannot betray the party,” he said, adding that he has the backing of 15-20 dissident MLAs who will take a collective decision on their future course of action. The intervention of the CM in what is Congress’ internal crisis has not gone down well with many in the party as it is being interpreted as a failure of the top brass. Though the drama had lasted for three days before it shifted to Delhi, none of top state Congress leaders, including party leader in Lok Sabha Mallikarjun Kharge or former Chief Minister Siddaramaiah, tried to tackle the situation by visiting the leaders. Patil left for Delhi on Friday evening accompanied by Dinesh Gundu Rao. He is expected to meet AICC leaders Ghulam Nabi Azad, K C Venugopal and, if necessary, Congress president Rahul Gandhi on Saturday. AICC secretary Satish Jarkiholi, who had met Dinesh Gundu Rao earlier in the day in Bengaluru, has threatened to quit from the post if his grievance is not redressed within two days. Jarkiholi left for Belagavi after the meeting and said that he will take a call in the next two days. Speaking to The New Indian Express, Dinesh Gundu Rao said that meetings were held with all the disgruntled leaders during the day.“Though these leaders have their grouses, nobody will go desert the party. Everyone will remain with Congress,” he said. The standoff also delayed the allocation of portfolios to the newly-inducted ministers, which was announced later in the evening. Team HDK Pads Up: Three days after expanding his ministry, Chief Minister HD Kumaraswamy on Friday announced the allocation of portfolios to the newly sworn-in ministers. There were no major surprises, though, except that the CM has retained the coveted Energy ministry.